I have been teaching English as ESL for 10 years in Portugal. I really like to share my stuff, learn with other teachers and this is definitely the right place to do it. Thank you all for your contributions! Hope mine can be of some use to you too. A great movie to talk about what one should or shouldn´t do when a person is trying to find a job. Enjoy! 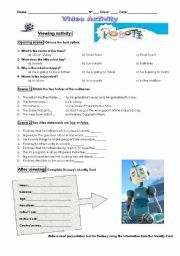 A companion worksheet to use while watching the film I, Robot. 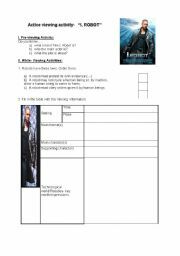 Easy activities and writing exercise included. Enjoy it! 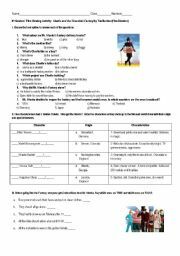 Here´s a worksheet I have just finished about Mr Bean. I made it in order to practice various verb tenses, but especially Past Simple/ Past Continuous.You can watch the whole episode or stop it and do a step-by-step following the differente exercises. Hope you like it! 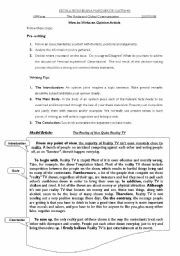 A simple worksheet to guide students writing a coherent opinion article. A friend sent me this comic strip which I found very amusing. I´ve translated the bubbles (Portuguese-English) so I can use it in my classes. 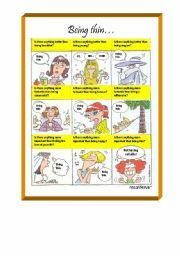 It´s a funny way to introduce comparatives and talk about the obessession of being thin. Hope you like it! Related to the topic Body Image, I´ve found this letter very interesting and with a very positive attitude towards one´s body. I used it wiyh my 9th grader students. 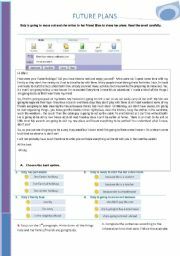 It includes a vocabulary exercise, a completing sentence exercise and reported speech. Hope you like. The template is from one of our colleagues here (thanks!). second part of the ppt. An illustration of some side effects of tv viewing habits with cartoons to comment and short texts to talk about.